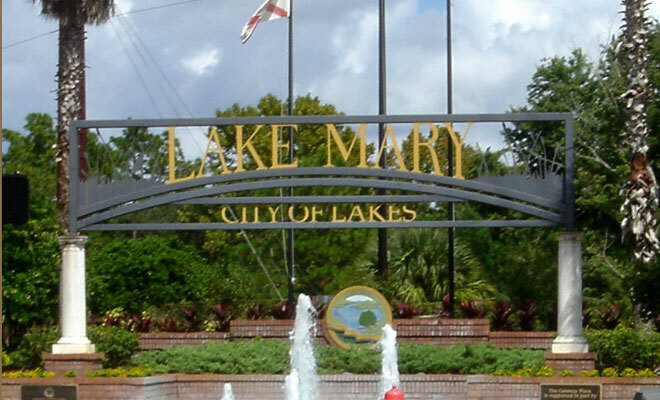 Lake Mary, Florida is one of the newer and beautiful, suburban communities north of Orlando metro, in Seminole County. Lake Mary FLhas one of the best reputations for real estate in Central Florida with a unique and vibrant community profile nurturing both business and residential interests. Lake Mary real estate encompasses delightful neighborhoods, parks, play areas, trails, lakes for boating and fishing. Real estate encompasses the Timacuan golf course, right in the heart of the town. Many more recreational opportunities abound in Lake Mary. At the same time, plenty of jobs, shopping, services, restaurants and entertainment make the prospect of living in Lake Mary all the more enticing. In fact, the community’s combination of natural beauty, conveniences, tranquil neighborhoods and desirable Lake Mary homes for sale, provide every reason to live, work and play here everyday. The City of Lake Mary is only about 30 minutes from Orlando, but hosts a small town charm, big on family-friendly, suburban appeal. Homes for sale in Lake Mary FL get a lot of attention for this back drop that includes a town rated #4 of 100 best places to live by CNN Money. Homes for sale earn more kudos from interested buyers with bushels of options in a wide variety of styles, floor plans, locations and competitive pricing. Get connected with Lake Mary FL and its numerous amenities. Find real estate details on neighborhoods, homes for sale in Lake Mary FL, schools, lifestyle preferences and more with a unique, map based search. Get connected with expert advice and real estate service if you have a question. Contact us at Tolaris Realty. Lake Mary real estate attracts new resident influx consistently. People tend to stay in the close-knit community that does a great job of making life easy with economic benefits, good schools, safe streets and a genuine sense of welcome. Add to that no income tax, desirable neighborhoods and homes for sale in Lake Mary FL, and you get the utmost value for your dollar. Find out more about the community, Lake Mary homes for sale, lifestyle preferences and more. Browse www.TolarisRealty.com. Use our map search and lifestyle finder. If you have a question, contact us directly. Come see your new dream home! Completely renovated with luxurious upgrades, this spacious and bright two bedroom two bathroom unit is sure to impress. Home features upgrades galore including flooring, cabinetry, countertops, hardware and fixtures. The unit is also an oversized two bedroom and therefore has space for washer and dryer. Regency at Lake Mary is a wonderful gated community in the heart of lake mary - very well landscaped with amenities including beautiful pool and jacuzzi, state of the art fitness and cardio center, beautiful playground, tennis courts, shuffleboard, clubhouse with a sundeck as well as a fitness center. Convenient 2 minute access to I4 and close proximity to shopping & dining as well as the Lake Mary business district. This home won't last long. Schedule your showings today! MUST SEE!!! 1/1 Condo in the BEAUTIFUL community of Notting Hill Located in the heart of Lake Mary. Many Upgrades and Tile throughout. Amazing value in this beautiful 55+ gated community. Swimming pools, tennis courts and a beautiful club house, with on site management. This 2 bedroom 2 bath home has additional square footage with a VERY open floor plan. Newer laminate flooring makes this home a great value, too! Fenced back yard and in the pet zone of the Forest. Spacious rear screened porch with vinyl windows and a workshop/shed with washer and dryer included. Back to market and now with a renewed kitchen, new cabinets, granite counter top. New bathroom vanity. 13; Gated community. 2 Beds & 1 Bath first floor unit. Close to schools, shopping & restaurants. Very convenient access to I-4, 13; Lake Mary Blvd and 417. Great schools district. Split floor plan with a beautiful view. Big screened lanai. Separate laundry 13; room. 13; Regency Park has 2 swimming pools, a playground, tennis courts, a fishing & swimming pier and walking trails. Easy to 13; show. Do not miss it. THE FOREST 55+ Gated Community. Nice home with a large front porch, large living area featuring 2 bedrooms 2 baths! Nice yard and Quiet cul-de-sac location. LOW HOA FEE with 2 sparkling swimming pools, hot tub, tennis courts, shuffleboard and beautiful club house. RV Parking at no additional charge. A beautiful condo, very clean with balcony. Located in the quiet Gated Community of Regency Park at Lake Mary. This condo has tile flooring in all of the wet areas, kitchen, dining, bathrooms and living room. Nicely carpeted master bedroom. Community includes tennis courts, gym, a heated spa great for after those workouts, 2 beautiful swimming pools, a playground and laundry facilities.